When it comes to bow windows prices you can expect the prices to vary dramatically due to the fact that the price includes everything from the windows to the carpentry, framing and finish work. When considering bow windows at the entry level you will find that you have a choice of frames available from fiberglass and vinyl with the majority of the frames being wood clad. 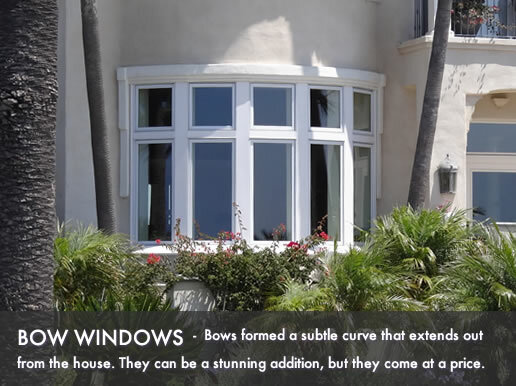 Bow windows are fixed windows mulled together to create a stylish design. Bows windows prices at usually limit the choice available when it comes to color and features and include a basic glass package. Standard bow windows prices are based on a fixed center window with side windows that can open using either double hungs or casement options. These windows usually include anything from three to five frames mulled together with a selection of hardware choices. Higher-end pricing for these projects usually include wood clad windows in sets of between four and eight windows which are mulled together. Other options include metal or aluminium frames on the exterior, though wood is the favored choice. You can expect a high end glass package, sometimes this includes superb insulation and a good spacer system or krypton fills. Another option is that the bow windows will include a fixed center window with the side windows being able to open either using awning or single or double hungs. Installation prices for bow windows vary between $600 and $2,000. The price can vary dramatically depending on whether the replacement window and opening are the same size or whether the opening needs to be made bigger to accommodate the new replacement bow window. For more pricing information, see our window cost calculator. Low cost replacement windows start at $1,400 and top out at $2,600 for each window. This price includes all materials and installation. Mid range project prices start at $2,600 and top out at $3,900 for each window. This price includes all materials and installation. Higher-end bow windows prices start at $3,900 and top out at $5,200 for each window. This price includes all materials and installation.